J. Craig Thorpe's interest in rail and art dates from his formative years in Pittsburgh, PA. His grandfather regularly took him on train and streetcar rides, and with his parents, he often lingered to watch the nightly passage of the Baltimore and Ohio's famed Capitol Limited. The imagery of those experiences shaped the foundation of a career. Thorpe studied at the Art Institute of Pittsburgh, and graduated from Carnegie-Mellon University with a BFA in Industrial Design. Following a short stint in the US Army Transportation Corps, he worked for architects and landscape architects in Virginia. After graduate school in New England, Thorpe moved to Seattle, WA. In 1985 he began free-lance architectural illustration. When Amtrak featured his painting of the new Olympia, WA station on its 1993 corporate calendar, Thorpe's rail art began to be recognized nationally. While Mr. Thorpe still does architectural illustration and historical rail art, his specialty is contemporary railroading. He is often commissioned to show future rail infrastructure and transportation options thereby helping to shape public perception and policy. All his work reflects the ethic that rail transportation enables the stewardship of land, resources and community. His clients include General Electric, the White Pass & Yukon Route, various state transportation departments and Amtrak. Notable among his Amtrak commissions is the 2008 commemorative art for the centennial of Washington D.C Union Station. Most of Mr. Thorpe's published works are oil-on-canvas, but many of his conceptual rail pieces use rendering techniques of pencil, ink and watercolor. His art has appeared in Arizona Republic, Denver Post, USA Today, National Parks Magazine, Alfred Runte's Allies of the Earth: Railroads and the Soul of Preservation, and other books, newspapers and journals. Mr. Thorpe serves on the executive Committee of the Issaquah (WA) Valley Trolley, a new rail line east of Seattle, and works with various organizations dedicated to formulating and implementing rail policy. He occasionally volunteers as an interpretive guide on the Cascade Mountain portion of Amtrak's Empire Builder. Mr. Thorpe is also often asked to speak on the themes of railroads, art and their relationship to landscape and community preservation. His wife and three grown children share his vision for rail as a necessary means for the preservation of America’s landscapes and cityscapes. I, Bob, have been photographing trains since I was 10 years old. This hobby was shown to me by my father and I have gone on from there. One thing my father taught me, that he did not do, was to take photos of everything because it will not be there forever. Therefore, I have a lot of roster type shots and good portrait material capturing the memories of railroads over the past years to the modern day. 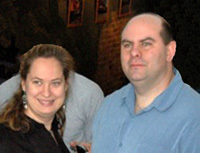 In 2001, I was dating and later married my wife, Amy. Her first introduction to trains was seeing the Frisco 1522, an engine I dearly love and miss. From that point on she was hooked. We spent our Honeymoon on the Southwest Chief and rode the Grand Canyon Railroad to the Grand Canyon. Today we both enjoy railfanning together usually turning it into a fun competition (she wins a lot). We also have a great time chasing trains, I do the driving and she takes the photos. We are also teaching our daughter how to photograph the trains. Railfanning and model railroading is truly a family thing at our home. I’m a transportation engineer (Traffic and Highway design, predominantly) by day and railroad “artiste” by night. I live in the Philadelphia area, deep in Reading/PRR/PC/Conrail/CSX/NS territory. I spent a couple of years in Southern Italy/Sicily and was exposed to the Italian National Railway and some of their working steam. I spent a few years in Provo, Utah, attending Brigham Young University and chasing the Rio Grande Zephyr before Thistle disappeared beneath the waves. My wife and I have raised/are raising six children (two still home, the rest having flown the coop), the oldest two having produced three grandsons interested in seeing “Grandolf’s” trains run in the basement. The “artwork” started as a means of learning and practicing CADD for work. Then I wanted to draw my model roster to test paint schemes for the basement empire using felt-tip pens. Then I learned how to color with the computer. Meanwhile, a rather large collection of drawings was accumulating on my hard drive. I was eventually persuaded to create a website to post my growing collection of what became a cheaper alternative to compulsively collecting miscellaneous model locomotives that I thought looked cool. Though I’ve had many express interest in having copies of specific engines for themselves, and have done some design work for a Z scale manufacturer, this is my first experience with a real live gallery. I hope you enjoy what you see. Ken Barrett is an artist who wants to be a scientist. His formal education included Liberal Arts and Biology at Fullerton College, Fine Art sculpture and painting at Minneapolis Art Institute, Graphic Design at the Art Institute in Los Angeles and Photography and Graphic Design at California State University at Fullerton. He was a Photo Journalist in the United States Navy and studied still and motion picture production at the U.S. Navy School of Photography in Florida. Ken spent the first twenty years of his career in the advertising field as a Creative Director, New Business developer and Event Manager. Clients were involved in Computer Technology, Recreation and the Travel and Food Industries. The artist is now working in the fields of Event and Wedding Photography, Residential and Restaurant Murals, Watercolor Paintings, and Digital Fine Art Photography. His pallet includes all traditional forms of water based media as well as digital cameras and computers. Christopher Dean Guenzler was born on December 31, 1957 with no hearing. Tubes were put in his ears when he was two, but struggled with a severe speech impediment that took years of hard work to overcome. About 1976, around the time of his High School graduation, he started taking train pictures. 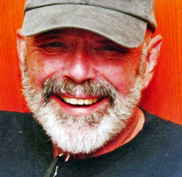 His love for traveling came from month-long vacations in a Ford Camper traveling all over the USA and parts of Canada. He graduated from Santa Ana Junior College with an AA Degree in Geography in 1979. He transferred to Cal State Fullerton where, after two years, he received a BA in Geography in 1981. He started working for Santa Ana Unified School District at MacArthur Fundamental Intermediate School where he worked in the PE Department and also coached Athletics for 11 years. During his 14 years at McFadden Intermediate School where he worked as an RSP Instructional Assistant and also coached, he became sober on January 18, 1995. He recently worked at Jefferson Elementary School. Chris started riding and documenting his train travels in 1980 and on August 18, 1995, he completed riding every mile of the Amtrak System. Chris completed riding trains in all 50 States with a ride on the Hawaiian Railway on November 12, 2000. Chris was aboard Algoma Central Train 2 on December 29, 2000 where at Agawa Canyon he finished all the inter city miles in Canada during a cab ride through beautiful Agawa Canyon in the dead of winter. On April 27, 2007 at milepost 425.5 at the Missouri River Bridge at Sibley, Missouri aboard the Southwest Chief, Chris passed his One Millionth Rail Mile ridden. On April 7, 2008 as Chris stepped off the Southwest Chief at the La Plata, Missouri Amtrak Station, he reached his One Millionth Amtrak Mile ridden. Throughout this, Chris wrote and took pictures which are on his website. Chris keeps riding trains today and is always looking for new pieces of railroad track to ride. As an artist, I enjoy creating these wood relief carvings as well as my other forms of artistic expression. This particular series, “Wooden Ironhorses” is one of my favorites. It captures my feelings about the by-gone days of the great trains. This series is my tribute to those glory days. I have been working on this art since my childhood. My earliest memories related to my art are that of walking along the train tracks in Sand Canyon, in the Canyon Country area of California. I was awed by the majesty of these mighty iron giants and their thunderous sounds echoed in my dreams at night. I saw the images of trains rolling down the tracks and at that moment, I wanted to carve one on wood. I remember working on my very first piece, a little train carved out of pine. I went down to a local frame shop in Canyon Country, where I had it framed and displayed. I was so surprised when the carving sold in just 2 weeks. I was just 14 years old at the time and was hooked. The life of the artist appealed to me more than ever and I haven’t looked back. The majority of my work deals with the expression of the detail on the train. The “Ironhorse” has to have an antique look, showing off all the minute structure of the piece. My earlier pieces dealt with the whole train, but my current group of carvings is absolutely detail-oriented. I see the carving as a complete whole, even before I start putting a chisel to wood. My biggest wish for my art is that it be available for everyone to enjoy. It thrills me to see the expression on people’s faces when they look at my artwork. The compliments I get on my craftsmanship means the world to me. One of the hardest things for me to do is to part with each one of my carvings. I hope those who invest in these carvings are people who appreciate the “Wooden Ironhorses” as much as I do and will share this love with other people. Knowing that would make me happy. From the back porch of the family farm near Hayden, Indiana, Carl watched steam trains in the 50s on the B & O mainline between Cincinnati, OH, and St. Louis, MO. Carl learned much about trains from the train stories told by his Father. Many stories were from the summer of 1919 when his Father hopped the freights from Indiana to the Kansas wheat fields to work the threshing circuit. 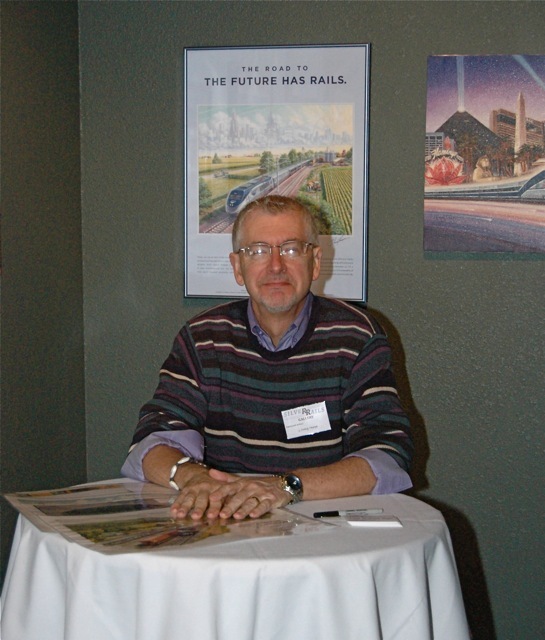 Carl began using his train photos in rail travelogues he authored for TrainWeb.com. An index of all his Rail Travelogues is at TrainWeb.org/carl. During summer vacations during his 40-year high school teaching career, Carl traveled extensively by train with wife Sue and children Matthew and Carla on Amtrak. He began taking travel photos with Sue in Canada, Mexico, Europe, the Middle East, the Mediterranean, and Egypt. He has won photo contest awards in California at: The Del Mar (San Diego) Fair; Orange County Fair; Knott's Berry Farm; and the City of Placentia. In Indiana at the Hayden, Indiana, Historical Museum; and elsewhere at Lighthouse Depot Magazine; BetterPhoto.com, and Ponte Winery in Temecula, California. He has sold photos to a Social Studies textbook company, in local art fairs, the Oceanside - Carlsbad Art League, in a Depot Inn & Suites advertisement in the Amtrak System Timetable, and held a one-man-show in Seymour, Indiana. Carl has written articles with photos for Super Chevy magazine, TrainWeb.com, and is working on an article in the new American Road Magazine on a trip he took Coast-to-Coast, following transcontinental Highway 50 (passing the farm he was born on near Hayden, IN) in a 1956 Chevy in 2004. West Winery, Macon, Missouri, features two of his train photographs on two wines from The Railroad Winery. He has train notecards, calendars, and train photographs to view and purchase at the Silver Rails Gallery, La Plata, MO, as well as his Outdoor Photography website: MoKnowsPhotos.com. I got into the world of trains growing up around my father who at the time was also a fan. He has moved away from the railroading world and I have stuck with it. I find that railroading is my Zen, the one stability in life that will always be there for me no matter what the circumstances; which is why I find myself so immersed in it every day. Growing up in the 1990's with mega-mergers and power shortages to fuel his passion; spilling over into 2 specific areas of rail fanning: model railroading and photography. In the model railroad world I find myself digging for accuracy and detail, not only in the realism of the models but in representing the world around the era being modeled. I am proud to call myself a true Rock Island fan and plan to build a railroad representing The Rock in '79 from LaSalle St. Station to the Quad Cities Area. Photography did not really develop for me until a few years ago. As a child I took photos here and there, but looking back, nothing really to write home about. That has changed now. As far as a perspective on photographing trains today, I strive to reach a more artistic form while involving as much of a powerful feeling as I can into each photo.